The game's development is coming to a close now and the first day of school is approaching so it's time to get the last really big task complete. Finishing the rest of the game's enemies and bosses. Spriting and coding them all may take over a week, but when that's done the game is basically in complete alpha shifting toward beta as I add in finishing touches and balance stuff. 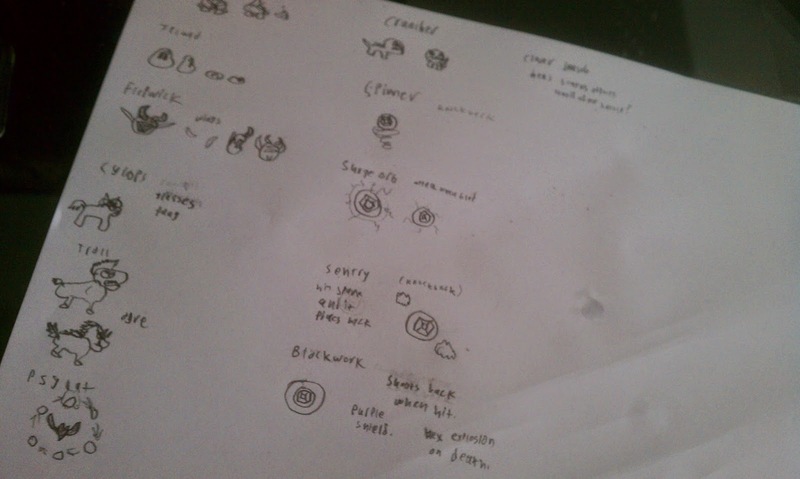 I plan on saving the more exotic and tricky designs from the original document for the next game. I feel like I can make better use of them in a grid-based realtime combat system. These simple guys I sketched will get the job done and flesh out the game enough to entertain for a couple hours. They behave differently and will keep battles from feeling like a shooting gallery.